Abstract—This paper aims to promote a power generation company experience on non-renewable energy management within environmental preservation and commitment. The environmental commitment reflected on Sustainable Program to overall environmental aspects, social perspective also taken into account. Strategic Programs on each aspect shared in this paper consist of (1) Socialization of Environmental Policy and Environmental Team Incubation; (2) Solar Cell Utilization; (3) Replacement of Freon as Refrigerant for Operation Support; (4) Priok Vehicle-less in Red Zone Area; (5) Utilization of WWTP Sludge for Mixture Ingredients of Paving Block; (6) Solid Waste Preservation from Kali Japat Stream; (7) Utilization of Ablutions Water for Plants Watering; (8) Replacement of NaOCl as Water Biocide in Water Intake of CCPP 1-2; (9) 1,920 Endemic Crops Plantation in Setu Babakan – a Cultural Heritage Kampong of Betawi Community; (10) North Jakarta Local Community Development Through “Kampung Sehat”. These ten noticeable programs in on going in 2016 with underlined purpose are to preserve and protect Jakarta’s surround environment. Annual progress has also reported on Environmental Compliance and Beyond Assessment, commonly known as PROPER, under Directorate General of Control and Prevention of Environmental Damage, Ministry of Environment and Forestry, Ditjen PPKL - KLHK. Index Terms—Environmental commitment, ten strategic programs, priok combined cycle of power plant, North Jakarta, environmental reporting, and proper. Dewi Permatasari is with Renewable and Non-Renewable Energy Sector, Indonesia (e-mail: dewi16permatasari@gmail.com). Flavianus Erwin Putranto and Tri Tjahjonoputro are with PT. Indonesia Power – GSU Priok, Jakarta, Indonesia (e-mail: erwin.putranto@indonesiapower.co.id, tri.tjahjonoputro@indonesiapower.co.id). 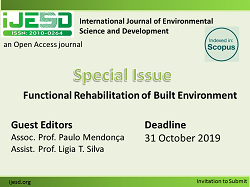 Cite: Dewi Permatasari, Flavianus Erwin Putranto, and Tri Tjahjonoputro, "10 Environmental Innovations in Harmony of Sustainable Electricity Generation: An Experience of Combined-Cycle Power Plant of Priok, Indonesia," International Journal of Environmental Science and Development vol. 8, no. 9, pp. 665-672, 2017.